Gene Krupa was an American jazz and big band drummer and composer, known for his highly energetic and flamboyant style. The name Gene Krupa is synonymous with a driving drum style and a dynamic sense of showmanship--qualities that made the Chicago-born drummer one of the musical giants of the Swing Era. Behind his public image--the gum-chewing hipster with the uncontrollable shock of black hair--Krupa was a devoutly serious and self-disciplined musician. As Benny Goodman would recall in his autobiography Kingdom of Swing, "No matter how much playing [Krupa] did, he was always working, developing his hands, and getting new ideas." 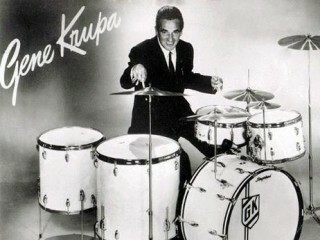 Krupa's technique and explosive attack earned him praise from all quarters of the jazz world, from traditional swing stylists like Buddy Rich to modernist drummer Max Roach. The youngest of nine children, Eugene Bertram Krupa was born on January 15, 1909, in Chicago, Illinois. After the untimely death of his father when Krupa was young, his mother went to work as a milliner to support her family. At around the age of 11, Krupa got a job running errands and cleaning windows at Brown Music Company, a music store on Chicago's South Side. With the money he earned, Krupa decided to purchase a musical instrument, and he ultimately chose the drums, the "cheapest item" listed in the wholesale catalogue. Taken with the idea of playing the drums, Krupa searched his South Side neighborhood for the company of young musicians. "There were a few little bands in school that I got to hear at socials and tea dances," the musician recalled in Drummin' Men. "I'd watch the drummers and pick up what I could. After a bit, I got to make music with some of these fellows and substitute at the dances and socials." Soon Krupa's musical activities began to take precedence over his school work. As a result of his late-night musical activities, Krupa often fell asleep during classes. In 1924, in an effort to placate his mother' disappointment over his failing school studies, Krupa enrolled in St. Joseph's College, a seminary prep school in Rensselaer, Indiana. At St. Joseph's, Krupa studied under a classically trained professor of music, Father Ildefonse Rapp. Although Krupa received first-rate instruction at St. Joseph's, he decided to leave the school in 1925 in order to pursue a career as a professional drummer. He soon played various jobs around Chicago with commercial dance bands such as the Hossier Bellhops, Ed Mulaney's Red Jackets, and the band of Joe Kayser. Living on the South Side, Krupa spent evenings searching for jazz in neighborhood cabarets and nightclubs. In the spring of 1927 Krupa discovered a talented group of young white jazzmen playing at a South Side movie house. Known as the Austin High Gang, this devoted coterie of musicians included banjoist Eddie Condon, saxophonist Bud Freeman, and Dave Tough, the premiere white Chicago drum stylist. Krupa "sat through two shows every night and three on Saturday to hear Tough on drums," remembered Condon in his autobiography We Called It Music. Soon afterward Tough, in an effort to introduce his younger protege to authentic jazz, took Krupa to see the great New Orleans drummer Baby Dodds. "Baby was the band's central strength," reminisced Krupa in Drumming Men, "the way he used the drums, the rims, the cymbals was just marvelous. I kept coming back to dig Baby, always showing my appreciation for the extremely musical things he was doing. He was one of my main inspirations." Krupa was so impressed by Dodds that he began to immerse himself in the study of black jazz. Austin High Gang member Milton "Mess" Mezzrow recalled in his autobiography, Really the Blues, how he and Krupa analyzed the rhythmic patterns of New Orleans drummers: "More than anything, it was the Negroes' time and rhythm that fascinated us. I would sit there with Gene for hours, just beating out rhythms of Zutty Singleton and Johnny Wells until my hands swole double." By 1927 Krupa was attending a regular jazz jam session held at the Three Deuces, located across from the Chicago Theater--legendary sessions that included Austin High Gang clarinetist Frank Teschmaker, trumpeter Bix Beiderbecke, and Krupa's future employer Benny Goodman. In December of the same year, Red Mckenzie assisted the Austin High Gang in landing a recording session with the Okeh label. Billed as Mckenzie's and Condon's Chicagoans, Krupa, Freeman, Teschmaker, Condon, bassist Jim Lannigan, and pianist Joe Sullivan recorded four sides: "China Boy," "Sugar," "Nobody's Sweetheart," and "Liza." Expecting to use his entire drum set, Krupa became outraged when producer Tommy Rockwell demanded that he play the standard set-up: a snare and cymbals. Although Krupa argued that the recording equipment could not handle the vibration of the additional drums, Rockwell finally agreed, at Mckenzie's urging, to allow Krupa to use his entire kit. "So they let Gene play the drums, and he beat the heck out of them all the way through the set," described Jimmy McPartland in Talking Jazz, "It gave us a good solid beat." Assessing the impact of the session, Condon wrote, "Krupa's drums went through us like triple bourbon." The success of the Okeh session didn't just mark the first known recording of the bass drum in jazz music, it defined the Chicago jazz sound. As Richard Hadlock pointed out in Jazz Masters of the Twenties, Krupa was the "biggest surprise" of these sessions, "an unknown, whose well-recorded drum work ... rocked the New York Jazz cliques." In 1928 Condon's Chicagoans headed to New York to back singer Bee Palmer. When the job fell through, Krupa and the Chicagoans recorded sessions with trumpeter Red Nichols and trombonist Miff Mole. After playing with Nichols's band, Krupa performed with the pit band for George and Ira Gershwin's 1930 Broadway production Strike Up the Band. "Gershwin was crazy about his playing," explained Max Kaminsky in My Life in Jazz, "because Gene was the first white drummer who could swing the beat so that the chorus girls could kick, in time." While working with commercial groups in the early 1930s, Krupa, determined to become a "legit" drummer, began formal music instruction with "Gus" Moeller. Practicing eight hours a day, he worked on inventing his own rhythmic variations and patterns. "My work with Moeller," related Krupa in Drummin' Men, "made possible more graceful playing, better control and freedom to be myself no matter what kind of music I had to interpret." In 1934 record producer John Hammond traveled to Chicago to recruit Krupa for Benny Goodman's big band. Although Krupa had reservations about joining, Hammond convinced him that he would be a featured performer of the Goodman band, a noncommercial swing group featuring the arrangements of Fletcher Henderson. "Our drummer was merely adequate," explained Goodman in Eddie Condon's Treasury of Jazz. "The man we wanted, Gene Krupa, was in Chicago playing with Buddy Rogers." Through Hammond, Goodman hoped to draw Krupa to New York City, for as he stated in Kingdom of Swing, "Gene had some not too favorable recollections of our previous jobs together, but he had the same feeling about real jazz that I did, and the chance to play music the way we felt it was as important in his life as it was mine." Joining Goodman in New York in December of 1934, Krupa performed on the NBC Saturday broadcast Let's Dance, a national radio spot that bolstered the popularity of Goodman's orchestra and brought great attention to Krupa's drumming talent. In 1935 the band's engagement at Los Angeles's Palomar Ballroom extended from four to seven weeks, drawing more than 200,000 listeners who responded wildly to the solos of Goodman, Krupa, and trumpeter Bunny Berigan. Around this time, Goodman formed a trio with Krupa and pianist Teddy Wilson, and a quartet featuring vibraphonist Lionel Hampton. Krupa's brush work with these two groups displayed his musical versatility and refined sense of accompaniment. By the late 1930s Krupa emerged as a national phenomenon. His work on Goodman's 1936 hit "Sing, Sing, Sing" produced the classic drum anthem of the Swing Era, and his appearance on stage and film catapulted him to superstar status. In 1938 he performed on Goodman's classic live recording Carnegie Hall Jazz Concert, which emanates with the intensity of Krupa's near-frantic drum work. Despite the popularity of the Goodman-Krupa combination, however, artistic and personal disputes prompted Krupa to leave the group in 1938. "They had different ideas about how to play music," explained band member Lionel Hampton in his book Hamp. "Benny didn't like all the crazy antics and sensationalism that he felt were overshadowing the real music. Gene thought the craziness was just basic showmanship. Although I tended to agree with Gene, I stayed out of it." On April 16, 1938, a crowd of 4,000 listeners gathered in the Marine Ballroom on Atlantic City's Union Pier to hear the newly formed Gene Krupa Orchestra. Following this triumphant debut, Krupa's band recorded several instrumentals, including "Wire Brush Stomp" and "Blue Rhythm Fantasy," for the Brunswick label. Among the Orchestra's talented members were trumpeters Shorty Sherok and Corky Cornelius, saxophonist Sam Donahue, and singer Irene Daye. In 1941 the band enjoyed even greater fame with the addition of trumpeter Roy Eldrige and singer Anita O'Day, who together gave the band its most legendary hit, "Let Me Off Uptown." In 1943 Krupa was arrested in San Francisco for the possession of marijuana. Out on bail after an 80-day period of incarceration, Krupa returned to New York. Although the case was finally dropped, it caused the break-up of his orchestra. Leaderless, Krupa decided to accept an offer to rejoin Benny Goodman's band. In 1944 he joined Tommy Dorsey, and, despite his condemnation by the media concerning his drug charge, was voted best drummer in the Down Beat Readers' Poll. In re-forming his orchestra, Krupa made an effort to explore the new modernist trends rooted in the bebop jazz movement. Between 1945 and 1949 his band featured such arrangers as George Williams, Neal Hefti, Eddie Finkel, and saxophonist Gerry Mulligan, who brought the band the instrumental score "Disc Jockey Jump." Krupa's musical line-up featured a number of contemporary jazzmen, including saxophonist Charlie Ventura, clarinetist Buddy DeFranco, trombonist Frank Rosolino, and trumpeter Red Rodney. Describing Krupa's artistic commitment to the new styles of jazz, Rodney explained in From Swing to Bop, "Gene was a modern, progressive-type person who, unlike most of the big-name bandleaders of the era, decided change was important, necessary, and right." With the demise of big bands during the 1950s, Krupa began performing in small combos and toured internationally with Norman Granz's Jazz at the Philharmonic. In 1959 his career was honored with the biographical film The Gene Krupa Story, starring Sal Mineo as the famous drummer. After suffering a heart attack in 1960, Krupa became limited to sporadic performances. During 1972 and 1973 he played several reunion concerts with Goodman's band--one of which resulted in the 1972 live album Jazz at the New School. On October 16, 1973, Krupa died at his home in Yonkers, New York. Though he had been under treatment for leukemia for several years, the official cause of death was heart failure. Attending a requiem mass held at St. Dennis Roman Catholic in Yonkers, Goodman, Freeman, McPartland, and Teschmaker gathered to pay their last respects to a man known by millions of listeners as "The Chicago Flash"--the most charismatic and innovative drum legend of the Swing Era. -(With Charlie Ventura) The Krupa-Ventura Trio, Commodore, 1950. -Hey! Here's Gene Krupa, Verve, 1951. -Gene Krupa Trio, Clef, 1953. -Gene Krupa Trio at JATP, 1953. -Gene Krupa Sextet #1, Clef, 1954. -Gene Krupa Quartet, Clef, 1955. -(With Lionel Hampton and Teddy Wilson) Selections From "The Benny Goodman Story", Clef, 1956. -Sing, Sing, Sing, Verve, 1957. -The Exciting Gene Krupa, Verve, 1957. -Gene Krupa Plays Gerry Mulligan's Arrangements, Verve, 1958. -The Gene Krupa Story (film soundtrack), 1959. -The Original Drum Battle, Verve, 1962. -The Great New Gene Krupa Quartet Featuring Charlie Ventura, Verve, 1964. -Let Me off Uptown: The Essential Gene Krupa, Verve, 1964. -The Drummer's Band, Verve, 1966. -Compact Jazz: Gene Krupa and Buddy Rich, Verve, 1994. -The Best of the Gene Krupa Orchestra, Columbia, 1993. -With Benny Goodman Benny Goodman: The Famous 1938 Carnegie Hall Jazz Concert, Columbia. -King of Swing Vol. 1., 1937-1938, Concert No. 2, Columbia. -The Great Benny Goodman: Original Performances of Benny Goodman's Classics in Swing, Columbia. -Benny Goodman's Greatest Hits, Columbia. -Benny Goodman and his Orchestra: The Harry James Years, Vol. 1, Bluebird. View the full website biography of Gene Krupa.